The study of political discussion has been broken into sub-categories including deliberative democracy, discursive studies, dynamics of interpersonal communication, and discussion network analyses, with substantial numbers of books and articles covering each. However, these areas are often treated distinctly and not brought together in a comprehensive and systematic way. Part I studies deliberation and discussion as the object of analysis. Part II concentrates on the consequences of political discussion and deliberation. 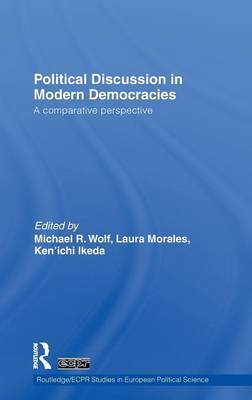 Covering ten countries across Europe, Asia, and North and South America, this book makes a significant contribution toward broader theories of political communication, deliberative democracy, discussion networks, and political behaviour. It will be of interest to scholars of comparative politics, political communication, political behaviour, governance and democracy.